Hello, I’m Dr. Halls saying Thank-you for visiting. 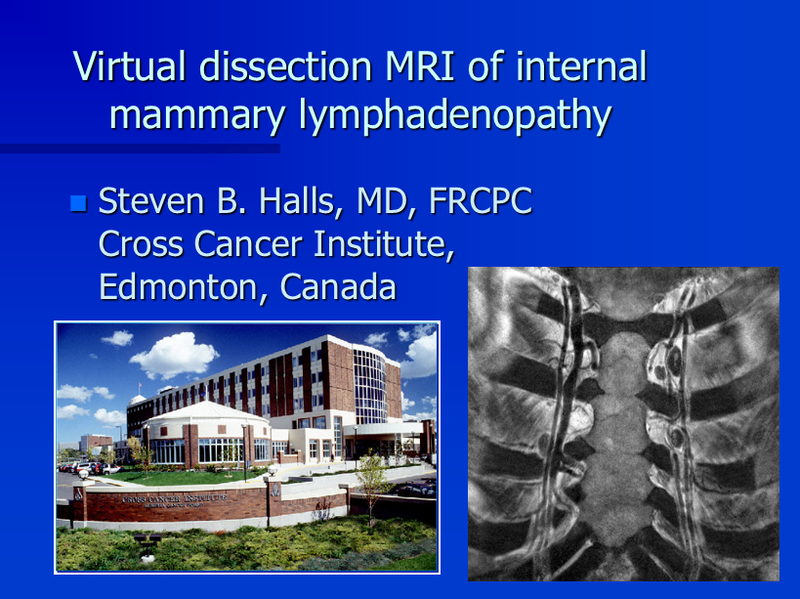 This page holds the slides of a scientific presentation that I made in Toronto at the ISMRM meeting, July 15, 2003, title Virtual Dissection MRI of Internal Mammary Lymphadenopathy. The abstract of this presentation on internal mammary lymph nodes is on that link. Here are the slides from the powerpoint presentation. I will also add some text separately, duplicating some of the words on the slides, for the benefit of search engines. And I’ll add some comments. I’m Steven B Halls, MD, FRCPC, and in 2003 I was working at the Cross Cancer institute in Edmonton, Alberta, Canada. A brief outline of the presentation. 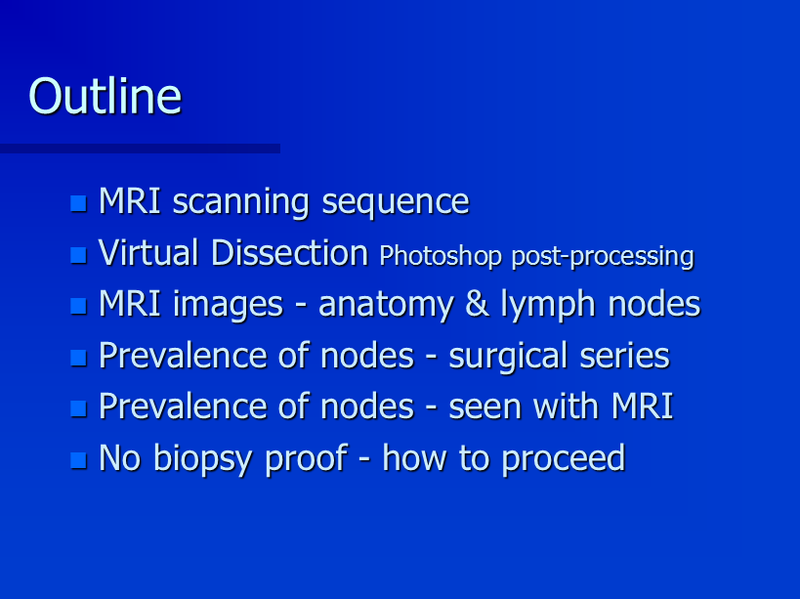 Discussing the MRI scanning sequence that was used, then the virtual dissection process using photoshop. Then showing anatomy of lymph nodes in the Internal mammary region. Discussion of surgical series and the prevalence of internal mammary lymph nodes. Of note concerning the MRI methods, is a 512×512 matrix size, which was considered very high resolution in 2003. The images were obtained in 2 separate sequences that overlapped each other in space. Back in 2003, MRI images were printed onto real films and mounted onto a lightbox. There was a way export the images into a digital workstation, and then convert into a photoshop format. This was a study performed on women with breast cancer. The study was approved by the research ethics board. The patient population is very typical, very average, for a breast cancer treatment center. The next 2 images are animated gifs. They show the process used in photoshop. What you are seeing is basically this: Images are stacked from deep to superficial, ie, from behind the breastbone, to the skin surface. Every time one image covers over the deeper image, the red area is erased, which reveals the interesting anatomy from the deeper layer. In other words, we get rid of the red areas because they aren’t interesting, so that the anatomy of internal mammary nodes and lymphatics and blood vessels, stays in view. At the end of each series of animated pictures, the last picture persists for 2 seconds, showing the final result. This is kind of a summary, showing how 6 images are combined into 1 image, that keeps all the blood vessels and lymphatic structures and nodes, in view. At this point in the presentation, I acknowledge that the study had no biopsy proof. Anything I “assume” is a big abnormal lymph node, has no proof that I am correct. Just sayin’. But I did discuss that the results I found, are similar to published proof using other methods. Basically, if it looks like a duck, quacks like a duck, it’s probably a duck. That is, these look like nodes and are in correct locations and numbers of them, so they probably are nodes. Please notice, that 4.7 lymph nodes were identified per patient, on average. It’s not a lot, by which I mean, NORMAL people and breast cancer patients, have less than 5 internal mammary lymph nodes, in total, in the combined right+left internal mammary regions. Why is this important? I’m pointing it out because it’s quite different from the axillae, where it’s normal to have 15 to 30 lymph nodes in 1 axilla. That simply isn’t the case in the internal mammary region. Nobody knew that, before this study. So I think it’s a simple item of knowledge to add to our brains. The image quality of MRI is sometimes poor, which lowered the number of lymph nodes found in the cases where image quality wasn’t perfect. Where are internal mammary lymph nodes located? These pictures below, show where all of the I.M. nodes were located, when they were under 3mm size. This is my most important picture on the whole page. This is the combined locations of all nodes from all patients. There are a lot of things to notice, of importance to planning radiation therapy. There are no nodes BEHIND the sternum. Yes there are lymphatic ducts, and this study saw some of them, but no nodes. The enlarged nodes were never below the 3-4 intercostal space. The enlarged nodes, or any I.M. nodes actually, were never found above the first costal cartilage. The internal mammary nodes are NOT spread out laterally between ribs. They’re only behind the medial 2/3s of the costal cartilage, not further laterally. 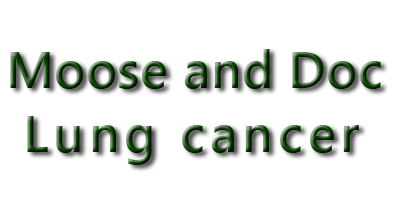 If you are a radiation oncologist, and were taught to aim your radiation beams over a very broad area, ‘just in case’ nodes might be there, now you know where they actually are, and you can narrow your treatment. I have also used the high resolution MRI methods for axillary lymph node location mapping. Those images and results were presented in other venues. More beautiful pictures of internal mammary lymph nodes, on MRI, from individual patients in the study are found on that link.